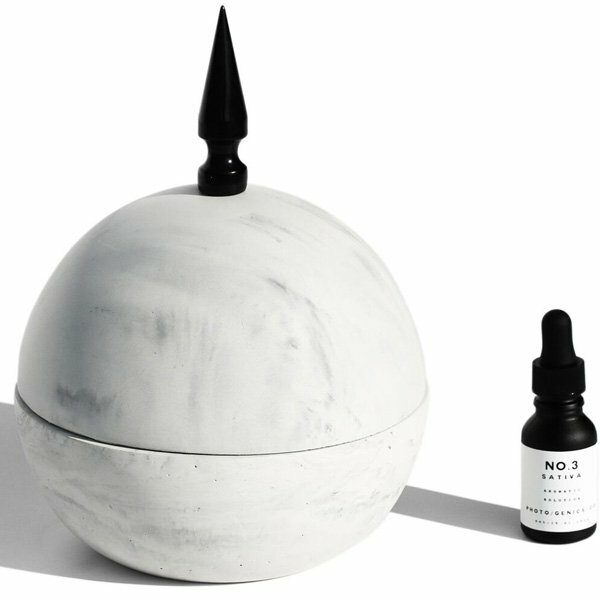 Photogenics Sativa Concrete Dome Diffuser Set comes with natural lava rocks, a large gray concrete bowl and lid, and a glass dropper bottle with an aromatic solution of No.3 Sativa scent. For use indoors. Heat may also be applied to activate the solution. Scent Notes: top: cannabis essence, musk; middle: sheer white florals, bergamot; bottom: tart geranium, tobacco.